A weekly newspaper produced 15 pages of coverage of flooding on its patch – despite its own office being destroyed in the deluge. The Boston Standard’s base on Church Lane was hit when the River Haven burst its banks last Thursday night and everything in its newsroom was damaged as the water rose to a level above the desks in the office. Journalists at the Johnston Press title are now working from the first-floor offices normally occupied by advertising staff, who have moved out to work at other buildings owned by the publisher. The title also produced 15 pages of coverage of the flooding in this week’s paper, which were the worst in living memory, including a wraparound front page, pictured below. Editor Stephen Stray said journalists had taken precautions before leaving the office last Thursday by raising electrical items onto desks, as river levels were high, but the water had risen above this. Journalists from the paper reported on the floodings on Thursday night, including Stephen spending time in an evacuation centre because around 250 people had to leave their homes. Stephen said the paper had been helped out by other businesses in the street who had also been flooded and journalists had worked in the offices of a local estate agent on Friday. He said: “We still continued to provide a service via the website. It has been a remarkable effort from the team and we did the best we could. Items damaged in the newsroom include the desks, all electrical equipment and the archive files – although these are drying out with the hope they will be usable. The ground floor of the paper’s offices is still drying out and it is not yet known when journalists will be back in there. 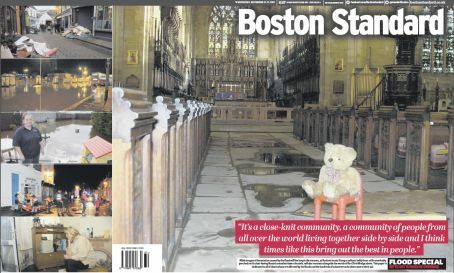 I agree with downnotout….the page 1 picture looks like Winnie the Pooh is taking a rest after urinating in a local church. Sometimes it’s perhaps best not to make a comment in these cases – except to tell the wet blankets to dry up and how about congratulating the Boston Standard team on a job well done? This was a big deal in the town and the Dunkirk spirit, business as usual and show must go on attitude will have been appreciated by their readers and advertisers. A genuine example of ‘we’re all in it together’ and an antidote to some of the news on this site. I know the Boston team reasonably well and they’ve done a great job here, Steve is a great editor who always goes above and beyond not only for the readers, but for his team too. If other editors and journos showed half the amount of love for the job and their readers then the industry would be a happier place! Part of the reason I left JP is staff are over worked and unappreciated- and it shows. This image is very reminiscent of Damien Day’s warzone reports from the first series of Drop the Dead Donkey.Every national disaster he ‘reported’ on oddly had a child’s teddy bear as a tearjerker…until he was busted by his editor for being the owner of said well travelled teddy bear. It’s a bit meansprited to moan about the teddy pic but of course it does look a bit silly and contrived. Was it the vicar’s ted, or the photographer’s, deliberately plonked there for the pic?